Heroes disappearing into the sunset, the desperate cry of a boy; those are some of the iconic references that connect us immediately to Shane (1953, George Stevens). A film that, right from its premiere, deeply bonded with its audience resulting in long-lasting affection and admiration through generations of movie lovers. This Good versus Evil fable –dividing homesteaders and cattlemen–, is dramatically seen through the eyes of a little boy. An underlying message, an important reflection on the use of firearms is fostered and echoed just as the thundering gunshots during the final showdown. Its subtle magnetism is breathtaking and inscrutable. Guided by Alan Ladd's immortal character, we will cross the valley of Jackson Hole to analyze this masterpiece and the work of George Stevens. "I like a man who watches things going around. It means he'll make his mark someday." Among almost all film enthusiasts, quite unanimously, Shane is regarded as a fundamental and singular motion picture. Although many of its elements are quite similar to other westerns; its approach and positioning on certain matters are not. It is in this regard that George Stevens' figure is key to understanding the scope of this film. 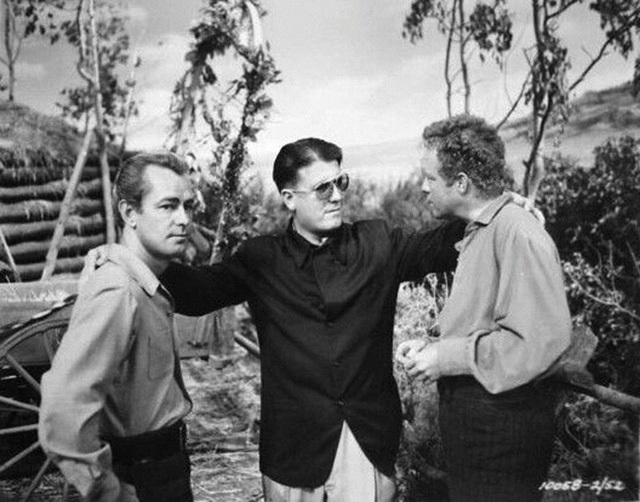 Alan Ladd, George Stevens (in the middle) and Van Heflin on the set of Shane. He was a director renowned for his thoroughness. For extended periods of time, he supervised both early and later stages of each film he was involved in. Meticulous research, script writing involvement and careful editing supervision were his modus operandi. So much so that this film –which was actually filmed in 1951– wasn't released until 1953, two years later. His was a great understanding of the filming process in terms of considering technical mastery, audience's intelligence and solid acting work before anything else. Perhaps not as prolific as other filmmakers, his body of work, as a whole, reflect such consistency and quality that others did not attain. Despite the number of different genres he approached, a recurring interest for the clashing of two opposing realities can be observed, from a physical and a moral point of view. Either through a battle of sexes, social classes, generations or even professions, the term 'coexistence' played a pivotal part in all his films. In addition to Shane, this need to coexist is evidenced in films such as The Talk of the Town (1942) or Giant (1956), to name just two of his most paradigmatic examples. This underlying message became more important over time. Like Frank Capra or William Wyler, who would also become the founding members of the short-lived production company Liberty Films, his vision as an artist changed dramatically during World War II. Throughout those years, he headed a film unit called Army Signal Corps Special Motion Picture Unit and shot historically unique scenarios and events both for informational and propaganda purposes(1). Witnessing D-Day, the liberation of Paris, as well as horrific scenes from the Duben labor camp and the Dachau concentration camp, market a turning point in his life and career. Knowing firsthand, the impact of just one bullet in a man's body, Stevens was shocked at the increasing use of violence in contemporary films when he returned from the war. I wonder what he might think of today's rate of violence... Having that in mind, the message and meaning underlying in Shane couldn't be on a more personal note. The fact that the first gunshots in the movie are not heard until almost an hour is also significant. It is not surprising that the director himself described the film as“my first western although it really was my first war film.”(2) Clearly, Shane is so much more than just a western. A recurrent practice of Stevens work was his concern for veracity and, particularly, for recreating the atmosphere of each film's time and place, with the utmost sensitivity. 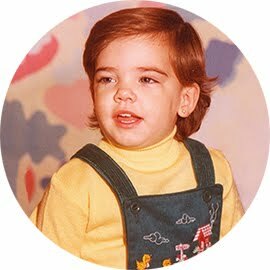 In order to accomplish this, he had the advice of Joe De Yong, a quite relevant member of the crew involved in the making of Shane. Primarily a Western artist and illustrator, he was an important technical adviser for this film. An early victim of spinal meningitis which caused him deafness, he spent his youth as a real cowboy fully within Indian territory, in Missouri. 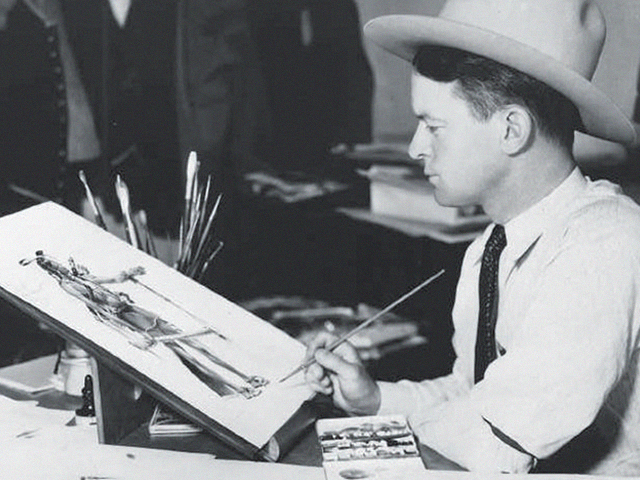 He also became fascinated with Charles M. Russell paintings –widely influential to George Stevens himself–. An extra for some westerns due to his dexterity with roping, he was hired by none other Cecil B. DeMille as a historical adviser and costume designer for The Plainsman (1936). From that moment on, he collaborated in several western productions. For this particular film, De Yong acted as a storyboard artist and costume and set design and even dialogue advisor. Ensuring that the tone and feel of the movie would be as similar as the period Stevens aimed to recreate. Image vía William Reynolds, ©Cowboys and Indians Magazine. The Western is a genre defined by the territory in which stories are set. To a greater or lesser extent, it has a tight bond with its environment. There is great solemnity in most of the landscapes that appeared on western film even becoming poetic and symbolic for some directors. For western lovers –such as myself–, the mere mention of Monument Valley(3) bring back memories from John Ford's masterpieces and images of scenery directly linked to his persona. Similarly with Ford's emblematic natural settings, the locations depicted in Shane cannot be only attributed to aesthetic reasons. To George Stevens, characters' surroundings contributed immensely to describe their attitude and development. In Shane, Grand Teton and Jackson Hole themselves become major characters in the film. 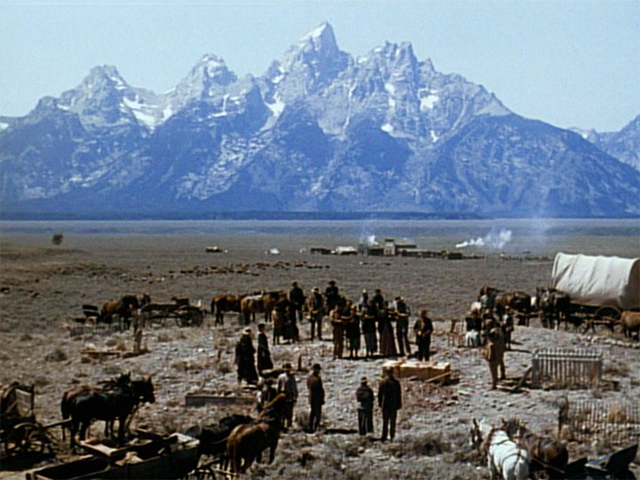 The work of American cinematographer Loyal Griggs and the use of 75mm to 100mm telephoto lenses, resulted in the capital depiction of the mountains appearing closer and away from characters depending on the purpose of the scene. Those nuances along with an impeccable craftsmanship earned Griggs an Oscar for best cinematography. Sadly, the only award for Shane that year. This marvelous scenery also manifests in all its glory in Spencer's Mountain (1963, Delmer Daves), Any Which Way You Can (1980, Buddy Van Horn), Rocky IV (1985, Sylvester Stallone) and, recently, in Django Unchained (2012, Quentin Tarantino). Grand Teton mountain in Shane. In his eagerness to convey authenticity, George Stevens also carefully supervised the sound for the film. Not only the beautiful score by Victor Young but also sound effects. George Stevens Jr. spoke about this in Shane DVD's audio-commentaries. He mentions its 'sound texture' for just like the movie itself, its acoustical approach has many layers. He specifically explains how he experimented a great deal with recoilless rifles and garbage cans and the shock that these effects had on audiences. It literally took their breaths away, specially because quite intelligently violence has an isolated presence and so its impact was much bigger. (4) This use of sound effects heavily influenced films like Bonnie and Clyde (1967, Arthur Penn), particularly in its final scene. 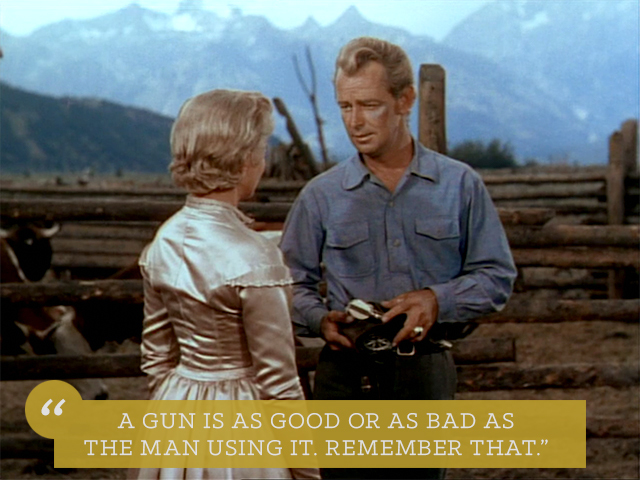 To emphasize the impact of violence through any possible means was such an important matter for George Stevens who left a clear and powerful message through this movie. As I explained in a previous post, initially, George Stevens had Montgomery Clift, William Holden and Katharine Hepburn in mind as the main cast for Shane. After working with him in A Place in the Sun (1951), Clift was supposed to play Shane, while Holden and Hepburn would become the Starretts. Although I deeply admire them, it is hard to imagine anyone but Alan Ladd as the eternal fringed buckskin hero. His performance is unforgettable. His deep voice, his melancholic eyes are the trademarks of a legend. An out-of-this-world quality for which Ladd should have earned more recognition and for which I will be forever grateful. His somewhat stoic appearance was key for this role. His message far surpasses his words for his eyes do all the talking. A mysterious and turbulent past, his affection for the boy and the Starrets, his understanding of what violence entails; can all be found in his sensitive and profound glance. Brandon De Wilde's impressions which constitute the film's point of view are entirely based on Ladd's performance. George Stevens was known for his way with actors and his capacity to obtain some of their best performances. Alan Ladd himself said on Stevens: "I like him. He gives me time. I may not be the best actor in the world but I am good at pauses. "(5) Such trust between the actor and the director was crucial and led to a deep friendship. So much so that, years later, Stevens initially offered the role of Jett Rink in Giant (1956) to Ladd, although he declined and the role subsequently went to James Dean with enormous success. Furthermore, I would also like to emphasize the work of two actors whom I also admire. I am referring in particular to Jean Arthur and Van Heflin. Specially Heflin was one of my grandmother's favorite actors and I can't help but have a deep affection for him. His incredible performance and his chemistry with Ladd is transmitted onscreen. They also became really good friends and that benefited the film immensely. Jack Palance turned out to be Shane's greatest discovery. His malevolent incarnation of Jack Wilson earned him an Oscar nomination and a very special place in cinema history as one of its all time favorite villains. He made his debut in Broadway and quickly gained recognition with plays of such magnitude as "A Streetcar Named Desire". His horseback riding skills were, however, nonexistent. The mere shooting of mounting and dismounting a horse took a lot of effort. It may therefore seem quite paradoxical that his most relevant roles were in western films. 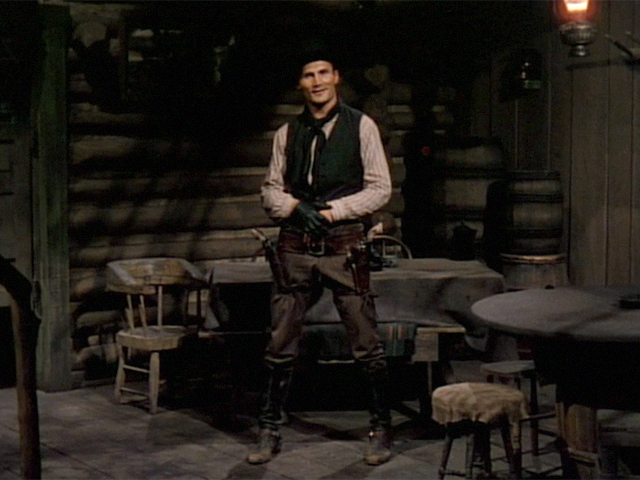 Jack Palance in the final duel in Shane. As stated earlier, one of the biggest achievements of these films is the consensus in its consideration as a masterpiece in motion pictures' history. The most amazing thing for me was to discover the heterogeneity among its most devoted fans. ¿Could a film bring together such diverse filmmakers as Clint Eastwood or Woody Allen? The answer is a resounding yes. They both agree in the impact that this film had in their careers. In Eastwood's filmography, Shane's character and, undoubtedly, westerns have paved the way for most memorable movies. Films like Pale Rider (1985), generally considered as a remake of George Stevens' film, or even his more recent Gran Torino (2008) –a favorite of mine– are clearly influenced by Shane. While Eastwood's predilection may come as no shock, I was indeed surprised when I learnt about Woody Allen's. In principle, he is filmmaker and film lover whose interest in western or "rural movies" –as he describes them– would be inconceivable. Well, in this article published in the New York Times in 2001, Allen confesses his ulterior love for Shane and his admiration for two other paramount western such as The Ox-Bow Incident (1943, William A. Wellman) and High Noon (1952, Fred Zinnemann). His words on George Stevens couldn't be more passionate –in Allen's terms–: ''I rank him very high. And this is on the basis of a very few things, really. The few of his films that I've liked, I've liked very much. 'Shane,' I think, is his masterpiece. I do think he would be right up there with my very few favorite American directors – of the era that I grew up in. Orson Welles is in a class by himself, but then, you know, John Huston and George Stevens and William Wyler.'' The definitive proof, however, of hi praise for Stevens work can be found in this video. It is really worth listening to. Lastly, I would like to mention Billy Crystal, as history struck me as a beautiful anecdote also related to Shane. As I came to learn, this was the first film he ever saw on the big screen, accompanied by none other than the great Billie Holiday –his father was an executive at jazz record label Commodore Records. What a way to start! He was mostly impressed by Brandon De Wilde's character –being around the same age at the time of its release– and Jack Palance. His long-lasting admiration got him to cast Palance as the villain in the film City Slickers (City Slickers, 1991, Ron Underwood), for which the veteran actor earned his only Oscar. 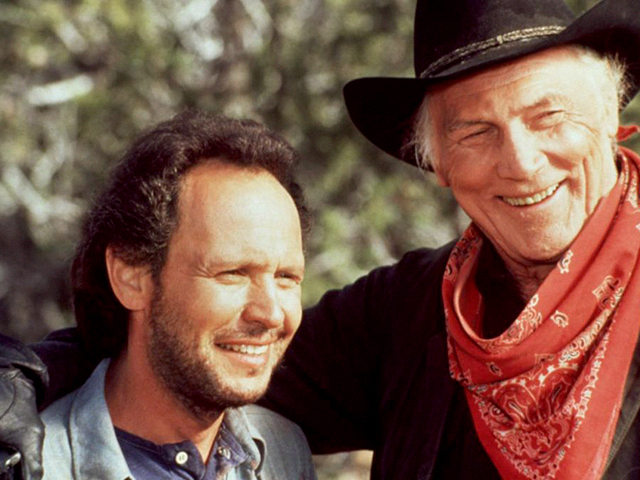 Billy Crystal and Jack Palance in City Slickers. Image via IMDB © 1991 Metro-Goldwyn-Mayer Studios Inc. All Rights Reserved. In 1943, George Stevens joined the "Signal Corps", the communication support service of the United States Army. It covered the campaigns of the north of Africa, then of London, where the general Eisenhower required a crew of 45 people for the Normandy landings. You can read more about it in Filming the Camps. From the book by Mary Ann Moss, Giant: George Stevens, a Life on Film. This valley is located in the United States, in the Navajo Native Reserve, on the southern border of Utah. His formations have appeared on many occasions in the cinema but especially was the setting for many westerns directed by John Ford.